Project files created in version 2.0.1 cannot be opened in earlier versions. All users are recommended to upgrade to 2.0.1. Lay Ahead and Pattern settings have changed in this version. When opening a file created in an earlier version, SFP will attempt to match old lay ahead and pattern configurations to the new settings. Never: Do not lay ahead. This is the same as the old Lay Ahead: No setting in previous versions. As far as possible: Lay ahead as many lines as possible, according to the number of available receivers. This is the same as the old Lay Ahead: Yes setting in previous versions. # of lines, exactly: Lay ahead exactly the specified number of lines. If there are insufficient receivers to lay ahead the required lines, SFP will display an error message and will not build the survey. Patterns are now configured in a separate dialog that is accessible either from Survey Parameters or from the map right-click context menu. Patterns are defined relative to any specified receiver line rather that relative to the first receiver line only. Multiple patterns can be defined. Source lines in patterns extend to the patch offsets. Patterns can be configured to roll on and/or roll off (i.e. for patches at the start and end of a receiver area). The screenshot below shows a simple pattern survey, with one pattern of two source lines starting -150m from receiver line 1 and one pattern of two source lines starting 50m from receiver line 4. 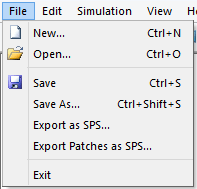 A new export option is available, to export a survey plan patch-by-patch to SPS format. For each patch, separate .r, .s. and .x files will be generated. Usability: Selection Properties display for shot transit tasks now includes turn time. Usability: Pressing ‘Finish’ in Survey Parameters dialog now only causes a survey rebuild if values in Survey Parameters have changed. Fixed: Incomplete XPS exports when receivers are obstructed. Fixed: ‘Start Shooting When’ being ignored on rolling spread surveys. Fixed: Presence of an obstruction sometimes results in missing patches.